Your stake will be given back only for one game so if you make more than one bet on the above games only the first bet will count. Win Away runs every weekend but the rapidly growing bookie will be introducing mid-week games regularly soon. 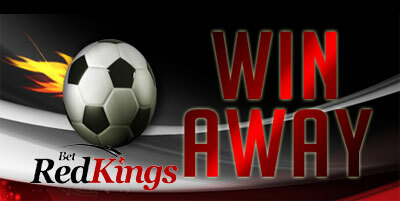 BetRedKings is licensed in Malta and is the sister brand of popular RedKings Poker and CasinoRedKings. Together the three brands offer the best in online poker, sports betting and their own casino software for slots and other well recognized casino games. Their spots betting odds are very competitive and they also offer cashback on net losses which is something very rare in the online betting industry. Only pre-game bets on 1x2 market count towards this promotion. ii) existing players who have made a minimum of 3 bets using their Real Money balance during the week they want to bet on WinAway. Previous Win Away game bets or bonus balance bets do not count. "BetRedKings Money Back Guarantee if you Win Away"